This year's Wisconsin Film Festival started for me on Friday with the first of the two screenings of Handmade Nation directed by Faythe Levine who has adopted Milwaukee as her home. I discovered that a co-worker was also in attendance across the aisle. She was clutching a pair of knitting needles and was busily stitching away as she waited for her daughter to enter the theatre. This gave rise to the suspicion that I was the only person in the audience who was not a crafter. The movie is a look at the so-called DIY craft movement which is a subset of the crafting community at large. According to the movie's website, the movement recognizes "a marriage between historical techniques, punk and DIY (do it yourself) ethos while being influenced by traditional handiwork, modern aesthetics, politics, feminism, and art." As a crafty resident of Milwaukee, Levine started the Art vs. Craft fair there and currently owns Paper Boat Boutique & Gallery. 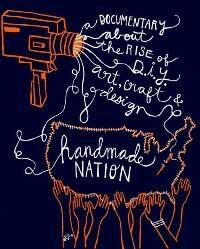 The Handmade Nation book, co-written with Cortney Heimerl, was released last fall. I'd read the book and was keen to discover what the movie would bring to the table. After a clever stop-motion introduction, we were introduced to Iliana Rodriguez as she loads a car in preparation for setting up shop at the Renegade Craft Fair in Chicago. She comments that the DIY craft scene involves many people who grew up being creative and are trying to incorporate creativity into their adult lives. All too soon, Ms. Rodriguez is gone (although she reappears later) and we are introduced to several other crafters in quick succession who each throw in a sentence or two which illustrate the description above. One woman remarked that her crafting was a stance against our hyper-consumer culture while another described it as "Something women can do on their own terms." The movie finally settled down after a few minutes and began to devote more than a few seconds to its subjects. Jenny Hart of Sublime Stitching was the first interviewee to get more than a couple sentences in. Hart, who commits act of embroidery, admitted that she was initially worried about the reaction to her work from purists. Luckily the purists, who were apparently much older, reacted positively and were quite happy that there was a younger generation taking an interest in the craft. As Handmade Nation continues, we are introduced to more and more crafters around the country such as the Buchanans of Milwaukee who do screen printing (I believe they are both UW-Madison grads and say in the movie that the U is a great place to learn the craft) and Deb Dormundy of Rhode Island who makes books. Along the way there are a lot of stories that echo one another – dissatisfaction with an office job and our consumer/big box culture of commerce are gripes that are repeated throughout the movie. Many of the crafters attended art school as well. Crafting is also a means of self-expression for these folks. They can take traditional methods and stitch them together with pop culture to create something more personal and meaningful. Don't be fooled, though. There were many light-hearted moments sprinkled in amongst the more serious philosophical rhapsodies. For instance there was Nikki McClure's comment about her very popular calendars in which she described them as her spores. Plus the aforementioned Deb Dormundy created a music video, some of which we get to watch. Despite an interesting subject, Handmade Nation bogs down rather quickly. While I enjoyed watching the crafters ply their trade and learning how they got to where they are now, hearing them all inveigh against consumer culture grew dull very quickly. This was a feature of the book as well but it at least had essays and contiguous pages of color photos to draw one's attention away from the rebellious repetition. The biggest disappointment, however, concerns those essays. In the book, profiles of individual crafters were grouped together by geographical location and between the sections devoted to a particular area of the country were essays that fleshed out the movement as a whole. Unfortunately, the subjects they tackled are almost absent in the film. That the DIY craft movement arose, at least in part, from the Riot Grrrl scene of the mid-1990s is discussed in the book but never broached in the movie. Another essay discussed the vital role the Internet played in the growth of DIY crafting. This was touched upon in the movie here and there such as when one subject said the Net was a great help but that she hoped it didn't close brick & mortar shops. But the dots were never connected and this is the main problem. We witness many people who discuss what they do and why but there's precious little which demonstrates how the subjects are bound together as a movement instead of crafters working in isolation. The craft fairs are portrayed as alternatives to big box stores but do they also bind the crafters together? The movie profiles individuals instead of documenting a movement. Handmade Nation felt like a supplemental DVD to the book which came in a sleeve taped to the inside of the back cover. 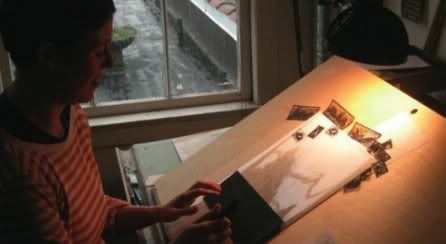 It would allow the reader to see and hear the subjects in action as opposed to only reading their words. Unfortunately, the movie didn't expand upon much from the book and, indeed, avoided many elements that made it an interesting read for me.